The first thought that comes to mind is “Peace of Mind”. This is what we all want, especially when it comes to our parents and what is best for them as they age. 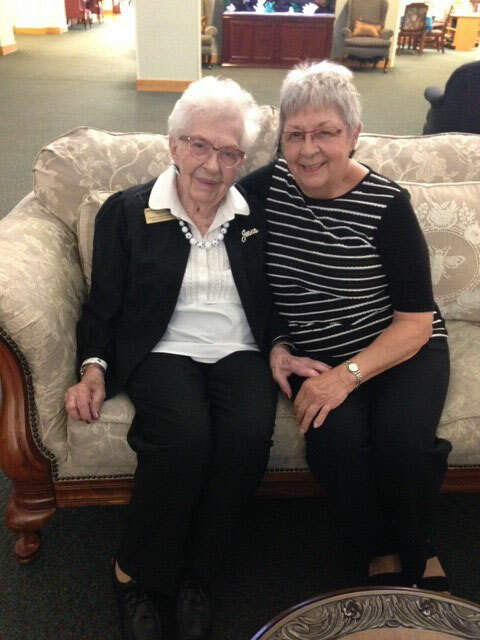 The minute you walk into the Senior Living Community you can sense the warmth and friendliness. When visiting the SLC, my friends and relatives have remarked on the welcoming feeling that greeted them when they entered the building. The building is open and full of light. It has many interesting touches, including the delightful ice cream parlor. I always tease my mother when she wonders, when leaving her room, which way to go to a specific place, reminding her that it doesn’t really matter because the hallways go in a large circle so you really can’t get lost. There is also a lovely center courtyard and a fenced yard with swings at the back of the facility. My mother lived in two other places before moving to the SLC. At the time the prior facility closed, I considered bringing my mother to live with me. However, I was well aware that my schedule would not permit me to be with her all of the time and she would not have much interesting activity to occupy her. I know that being involved in activities is important to keeping a healthy attitude and a positive outlook. The SLC Life Enrichment Staff is very creative and constantly on the lookout for challenging and fun ways to keep residents engaged. The residents also benefit from active community groups who regularly bring young people and adults to put on programs for the residents. My mother is a lifetime member of the Eastern Star and, therefore, she qualified for admission in September of 2013. I am pleased to know that the SLC is now open to all, whether they are members of Eastern Star or not. Had that been the case in 2003, I could have moved all of my relatives into this facility. One of my aunts was a member of Eastern Star but my other aunt was not and they wanted to be together. Now with the open admission process, relatives and friends who want to stay together can all apply. My mother is still very active but she is also a cancer survivor and what saved her life was an operation – a colostomy. She has now survived 12 years since her diagnosis of Stage 4 colon and colorectal cancer. As she aged, it was more challenging for her to manage her ostomy care, especially changing the pouch on a regular basis. She does not qualify for a skilled nursing facility since she is still quite healthy, but she needs help. I am so grateful that the SLC was open to having the caregivers receive training so that they can assist my mother. And many of the caregivers were happy to have another skill to add to their resumes. My mother is the first resident with this particular need.